Vaccination is typically associated with children. It's true, every child should receive the recommended childhood vaccinations. Many adults (of all ages) may need vaccinations as well - your age, your medical history, your work and personal habits, whether or not you travel overseas - these factors all play into the need to vaccinate. Start by understanding one simple fact: Vaccines are not linked to autism in children. Period. Many, many scientific studies have been done and never, not once, when utilizing sound research based on gathering and measuring information that provides conclusive answers to stated research questions and hypotheses, has an evaluated outcome linked autism to vaccines. The number of vaccines children (and adults) receive is not more concerning than it used to be. Delaying their administration from the recommended national guidelines provides no benefit, while placing individuals and the greater population at higher risk. 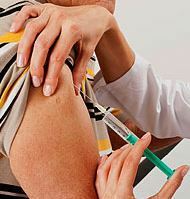 Many adults should be receiving age-specific vaccinations or boosters. Most don't. A vaccine is a medication. Like any medicine, vaccines have benefits and risks, and although highly effective, no vaccine is 100 percent effective in preventing disease or 100 percent safe in all individuals. Most side effects of vaccines are minor and short-lived. Serious vaccine reactions are extremely rare.